Did I really just complain about having to share a trail? I apologize! I’m thrilled so many folks love hiking as much as I do. And it really wasn’t that bad, except when an older couple passed us and the woman told us that we were the first group they had passed all day, having previously been the ones to get passed. Folks, that is NOT a compliment! Oh well, it was an incredible day for hiking. Crisp blue sky, dancing clouds, good friends, and we could not have asked for better weather. McAfee’s Knob is the most photographed spot on the Appalachian Trail. Today, I got to introduce it to two newbies (and one who hadn’t been there for many years). Yup, that’s the money shot. October is a tough month for some dear friends of mine. Two years ago they lost their youngest son to a sudden illness. I usually wear his remembrance bracelet when I am hiking. The bracelet says “be outrageous, be strong, be you.” I especially think of Sawyer when I’m on a high cliff or crossing a difficult creek. He was a fearless, spirited young boy who left this world way to soon. This one is for you my young friend. On the way down, we encountered a little guy that I really didn’t want to share the trail with. . . But since there were 4 of us and only one of him, I think we could have taken him if necessary. All around great day, thanks to my warriors for joining me on this really fun hike! No, this isn’t about horse racing. 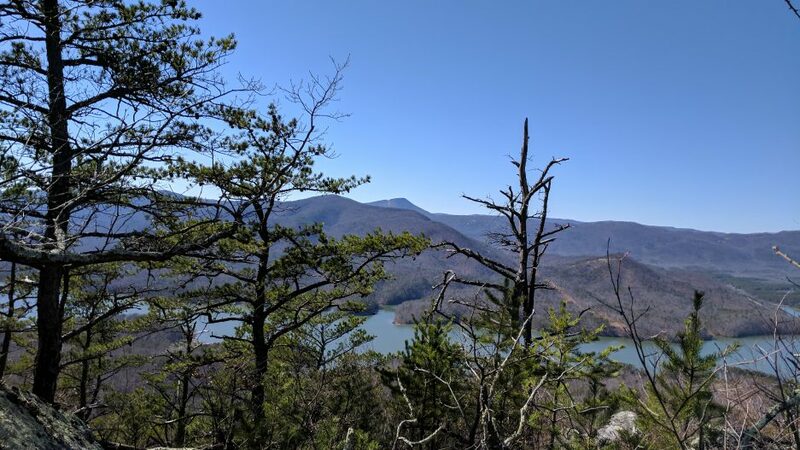 If you have hiked the Appalachian Trail, or live in Southwest Virginia, you know that the Triple Crown refers to 3 popular hikes on the AT. McAfee’s Knob – by far the most popular and most photographed spot on the AT – it even appeared in the movie “A Walk in the Woods.” The second one is Dragon’s Tooth, the tough hike that I finally completed earlier in the Spring. Finally, the lesser talked about, but gaining in popularity is Tinker Cliffs. I’m proud to say, that as of yesterday, JG and I have completed all three! It was a beautiful day for hiking, and we got an early start with some good friends. But thanks to all the rain Mother Nature has dumped on us lately, it was probably one of the muddiest hikes I’ve ever been on. We took the Andy Layne Trail which takes you through private land, with cows and bridges and snakes! This little guy was sunbathing at the end of the first bridge, while I called for backup. He eventually slithered away from the steps so we could move on. The cliffs are spread out over about a half a mile, so there’s room for everyone to find their special nook to enjoy the incredible view. That’s me, living the good life. The rock formations were also photo worthy. . .
and other interesting things along the way, like this tree – what?? After returning home, our friends fixed dinner for us! How wonderful, especially since they were just as tired as we were. Thanks Fred and Cindy – look forward to hiking with you again. After 8 miles, I thought I would feel worse than I do today. Physical Therapy is where it’s at my friends. Have a lovely weekend!